Begging: Bunny begging is adorable and extremely hard to resist. Rabbits may press their nose through the cage wire or run circles around your feet if you are holding a banana. Some sit up on the toes of their rear feet, stretching towards the delightful smell that has caught their attention. Rabbits are born with the knowledge that being cute will get them whatever they want. To accommodate the begging rabbit (and the rabbit owner's inability to resist), I recommend psychological treats. For instance, a 1/2-inch slice of carrot can be cut into four pieces and given to the rabbit at four different times throughout the day. Chewing cords: There are several theories as to why rabbits are attracted to phone cords, antenna cords, cable TV cords, lamp cords, etc. One theory is that they are attracted by the vibration from the electricity. Another theory is that the electricity makes a noise that is audible to the rabbit. Or could it be that the plastic that encloses the electrical wires tastes good? Who's to know? Whatever the reason, it's simply not safe to leave a rabbit alone in a non-rabbit-proofed room. Flexible plastic tubing (like that used in fish tanks, but a larger diameter) is one of the easiest ways to protect cords. The tubing can be sliced length-wise with a utility knife and the cord pushed inside. 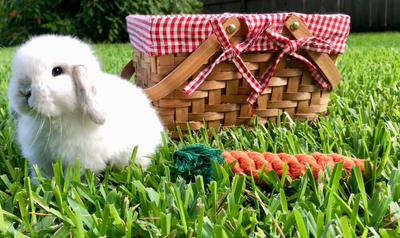 A few rabbits will continue to chew on the plastic tubing, but this provides the time necessary to let the rabbit know (by clapping or stomping along with a verbal NO) that it is not appropriate to chew on the tubing. Chewing wood: For pure chewing enjoyment and immense pleasure, there's nothing better than a nice piece of soft wood to gnaw on...for some rabbits. Many of my rabbits aren't the least bit interested in a piece of plain old wood and many never gnaw. But most do love a good piece of apple tree twig and will gnaw the bark from the twig as though it were a delicious treat. (Caution: Not to be fed are branches from apricot, cherry, peach, plum and redwood trees, listed as toxic by poison centers.) Gnawing is not necessary to keep their constantly growing teeth under control. * Some of my rabbits eat only Timothy hay and pellets, refusing all wood, and have perfectly good teeth. Gnawing seems to be more of a recreational activity than anything else, and attention can be diverted from a chair leg to an appropriate piece of wood or to a cardboard box by consistent and diligent action. Pulling hair from chest or legs. Pseudo-pregnancy occurs in unspayed females living with neutered males (or spayed females living with unneutered males). These females will occasionally think that they are pregnant and may build nests. They may even stop eating as rabbits do the day before they give birth. I've not observed this when all rabbits who live together are neutered. Shedding: Rabbits shed the same as do all animals with fur. From my experience here in the northwest, rabbits shed every three months. They have alternate heavy and light sheds. When people tell me that "my rabbit sheds all of the time, " I know that they do not understand the importance of combing/brushing when each shed occurs. Generally it may take two weeks for a rabbit to complete his shed if the owner has combed and brushed the rabbit. Occasionally, a rabbit who will normally shed in about two weeks will shed for a longer period even with daily combing. Thumping: "Thumper" of cartoon fame thumps many times in rapid succession before taking off for safety. That's not the way real rabbits thump. Rabbits stand on all four feet, in a somewhat tip-toe position, with their ears alert, then lift their rear feet and thump to warn everyone in the warren (including humans) that there is "danger," in the rabbit's opinion. They may remain in the thumping posture until convinced that the danger is gone. The length of time between thumps can vary from a few seconds to a couple of minutes and may last an extended period of time (even an hour or more). This "danger" could be a furnace, refrigerator or other electrical appliance turning on or a lit cigarette when they are not used to the smoke. "Danger" could be the shadow of a bird flying across the moon or a cat walking on the window sill chasing a shadow on the floor. Thumping can occur day or night and is the rabbit's attempt to save everyone fro!m a terrible fate. ​**A rabbit who is exhibiting continual thumping can die from fright and should be reassured and comforted as soon as possible. ​Hiding: Bunnies experience the mopey teenage years too between 16 and 20 weeks old! It doesn't last long, but during this time they may be temperamental, hide, bite, pee pee outside of the litter box, and in general have an attitude. Don't worry, your sweet playful bun will return back to normal within a few weeks.